During the holidays, when our lives are filled with joy and our bellies with seasonal delicacies, most of us also remember those in the world who are less fortunate. This year, I hope you will join me and donate to Menu for Hope by buying raffle tickets online for a wide range of food-related prizes. Menu for Hope unites food writers, bloggers, and readers from all over the world to raise money for those whose survival depends on food donations from the UN World Food Program (WFP). This year, funds raised by the 2007 Menu for Hope campaign will be earmarked for a school food program in Lesotho, a tiny country entirely surrounded by the Republic of South Africa, where one out of twelve kids die before the age of five and 56% of the population live on less than $2 per day. I donated one of the prizes being raffled. If you want to bid on my prize, designate prize UW05 when you donate to Menu for Hope. Because my prize contains food, I can only ship it to the United States or Canada. 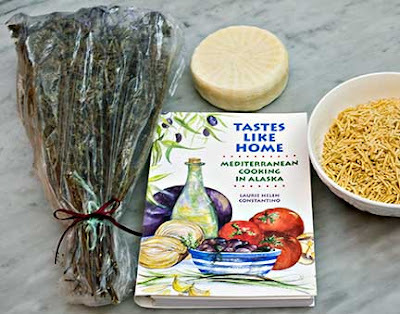 My prize is a package including (1) wild oregano hand-picked from the salt-sprayed hills of a Greek island in the North Aegean Sea, (2) hand-crafted sheep cheese still showing the imprint of the reed basket in which it was made, (3) hilopites (egg noodles) made with indigenous Greek wheat flour, free-range chicken eggs, and fresh sheep milk, and (4) an autographed copy of Tastes Like Home: Mediterranean Cooking in Alaska. 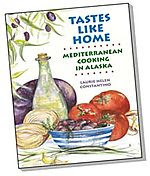 (To see the hilopites being made, go here: http://medcookingalaska.blogspot.com/2007/11/opening-lessons-with-recipes-for.html) . 1. Choose a prize or prizes of your choice from US west coast donors at http://www.rasamalaysia.com/2007/12/menu-for-hope-4-complete-west-coast_10.html or from the complete prize list at http://www.chezpim.com/blogs/2007/12/menu-for-hope-4.html#more . 3. Specify the prize you would like to bid for in the 'Personal Message' section in the donation form. Each $10 donated will get one raffle ticket toward a prize. For example, a donation of $50 can be 2 tickets for UW01 and 3 tickets for UW05. Please write 2xUW01, 3xUW05. Thank you so much for any donations you are able to make to Menu for Hope and for taking the time to read this post. If you know anyone who might be interested in donating to Menu for Hope, please send them the above information. Hi Laurie and congratulations for donating and posting on your site. I saw this the other day at another site but I think it was a bit late (to find sponsors) and complicated for me to organize something from my site. Maybe next year I can do something. What about if I follow your instructions and post it on my blog I may at least promote the whole event. What do you think? Get back to me if I can do this. Needless to say that the least we can do is to buy the raffle tickets . Hi Ivy! I think the more everyone promotes Menu for Hope the better! And yes, buying raffle tickets is something everyone can do. Thanks!! I love your prize package...! And I know that my mother will LOVE it even more...she has been wanting to get her hands on that 'salmoura' cheese for several years now. Hi Joanne! You should definitely buy a raffle ticket or two!